A sweet, lilting song that affirms that no matter what circumstance you find yourself in, God is watching, guiding and comforting you. A profound musical bridge gently proclaims, “God loves you! Hallelujah!” Excellent on guitar or keyboard. 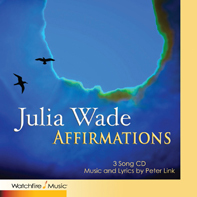 Due to many requests upon hearing Julia Wade sing this at TMC, we are releasing this song before the mp3 sample and download are ready. Sound Files will be coming shortly.